Snowfeet are made of highly durable and lightweight fiberglass reinforced material. Metal ski edges enable easy stopping. Heel brake lets you slow down. 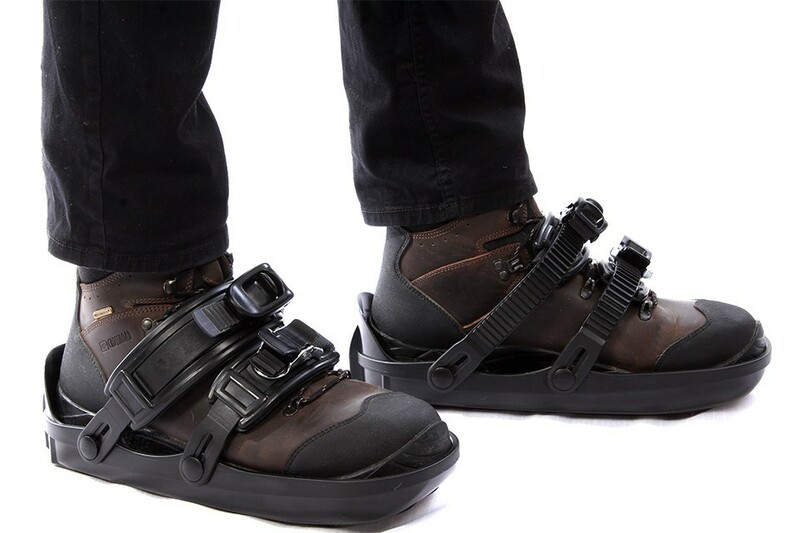 Adjustable bindings let you attach Snowfeet to any shoe. Use them for downhill on and off the slopes, in snowparks, through forest trails, and even for cross-country skiing. Just attach Snowfeet to any winter shoes or snowboard boots with bindings. We recommend waterproof shoes that fix your ankle firmly. One size fits all. We recommend Snowfeet for shoes of size: 5-13 US / 37-47 EU. So many people are excited about this new winter sport, it is going to take the world by storm. Some even assume it will be the next Olympic sport. We’ve already delivered thousands of pairs of the first model to our customers around the world, and the positive feedback has been overwhelming! We’re ready to ship the first 2000 pairs to our supporters before the end of this winter! That way, you`ll get to try Snowfeet this snow season! Snowfeet are extremely light and small, so they fit into any bag and are easy to carry around. You don’t need ski boots or any other heavy and expensive equipment. This is a previous version (formerly called Snowfeet), without metal ski edges on the base. Some ski resorts do not allow skiers to use this model on their slopes, because of the absence of ski edges. + Use winter shoes or snowboard boots. Snowboard boots should be a smaller size than 8 US/41 EU, otherwise, they are too large for bindings. We recommend waterproof shoes with ankle support for protection. 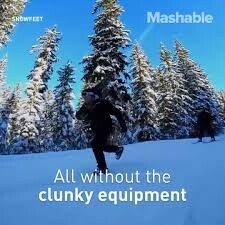 + You don’t need any special ski boots. + Highly durable plastic material. + Snowskates are short skis that you can attach to your shoes with straps. + Also known as Kluski. + Lenght = 40 cm. 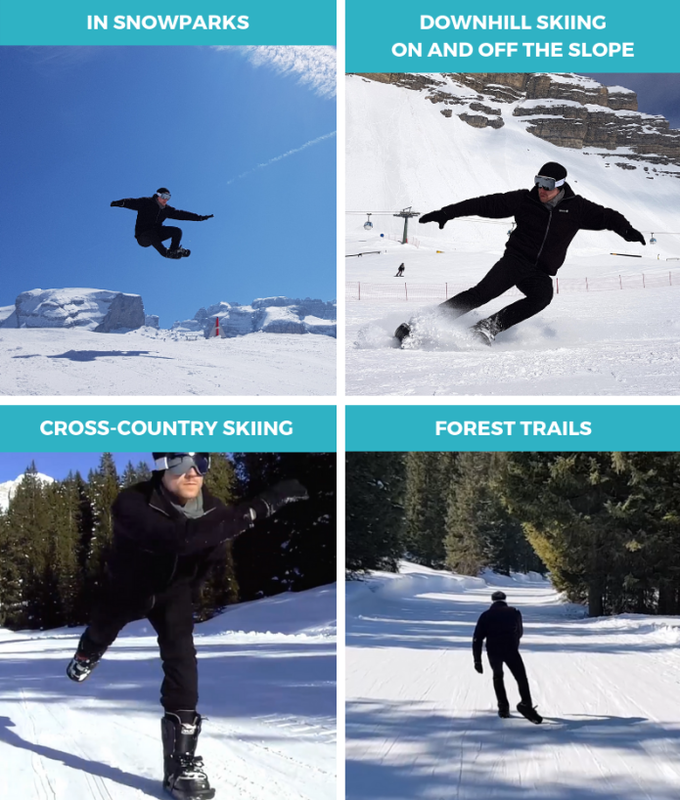 + Combination of skiing and skating. + Use regular winter shoes or snowboard boots. + Light and easy to carry around. Weight = 2 kg. + No need for any additional equipment. + Any person using this product is personally responsible for learning a safe way to ski, assumes all risks and accepts complete responsibility for any and all damages and injuries of any kind, which may result from the use of this product.